For a long time, Kristen Rezak, MD, and Amy Alger, MD, worked to avoid being in the same place at the same time. For the close, twin sisters, it wasn’t because of ill feelings or potential for an awkward conversation. It was purely practical. “I tell people all the time, if I don’t say hello, it’s probably not me,” Rezak said with a laugh. Despite following their own career paths, the pair’s lives have continually been connected. They both attended the Ross University School of Medicine and purposefully created different hospital rankings for residencies. Still, they ended up in New York City during their clinical rotations and eventually at Duke. “Our entire life has been a big, long infinity loop,” Alger joked. But Rezak is quick to point out their eventual reconnection at Duke wouldn’t have taken place if it weren’t for a combination of the health system’s reputation, opportunity to help patients and family. “Every time you move into a new system, it takes time to learn the system and about the trust and respect that comes from a new place,” Alger said. 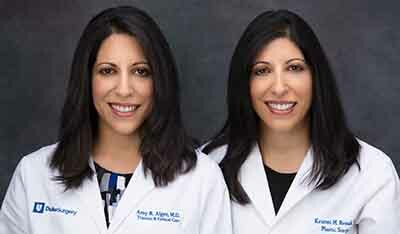 Original post at: https://1periop.dh.duke.edu/articles/two-kind-twin-sisters-reunite-duke-surgeons. See a similar story by Duke Today on the sisters: https://today.duke.edu/2018/12/sister-surgeons.